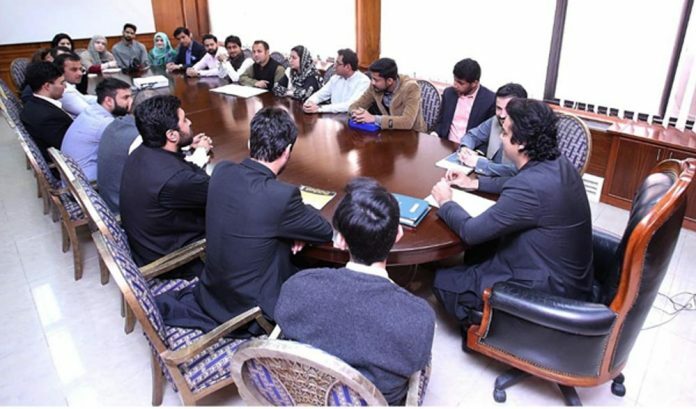 ISLAMABAD, March 26 (APP):A delegation of PILDAT’s young politicians fellowship programme Tuesday called on Muhammad Usman Dar, Special Assistant to the Prime Minister on youth affairs to discuss on scope of government initiatives for the socioeconomic development of youth. Muhammad Usman Dar briefed the visiting delegation on planned initiatives of the PTI government including National Youth Development Framework (NYDF), an overarching vision document for youth-focused development interventions in education, employment and engagement (3Es), a press release said. The special assistant added, “for the first time in the history the country, National Youth Council is being established under the NYDF, patronised by the PM, it would be a youth advisory body comprising of outstanding young leaders who have earned laurels in their respective fields”. In education, government is about to launch Startup Pakistan Programme to create a national eco-system for the development of innovation driven entrepreneurs (IDEs). Youth across all universities and 300 accredited TVET institutes would be trained in seven emerging technologies through digital incubation initiative for sustainable national economic growth. Moreover, under Skills Development Programme, 150,000 youth, both male and female, would receive effective technical and vocational training in both high-tech and conventional demand-driven trades to ensure their maximum employability. For employment, Government is launching Kamyab Jawan Programme, an SME-lending facility to offer subsidized business loans to the young entrepreneurs for running their own businesses. Usman Dar added, “For the first time in national history, clean lending facility would be offered to borrowers up to Rs. 500.000, whereas subsidized loans would be offered to other borrowers from Rs. 0.5-1, and 1-25 Millions”. Moreover, Government is about to launch National Youth Employment Exchange (NYEX), a programme to link demand and supply in the labor market through an online portal. To promote civic engagement, Government intends to launch Green Youth Movement (GYM), and Jawan-e-Maidaan programmes. Under GYM, 2-3 Billion trees out of 10 Billion Tree Tsunami Project, would be earmarked for plantation by youth, which would not only productively engage them socially but would also be a source of economic empowerment for them. Usman Dar concluded by saying that the PTI Government is focused on bringing institutional change to achieve socioeconomic empowerment of youth. For this reason, it is working on establishing National Youth Development Programme (NYDP) through an act of Parliament. He reiterated, “for the first time in our national history, we are going to develop National Youth Development Index through a national district-level youth development survey. This survey would also provide baseline statistics for introducing youth-focused legislation in the Parliament”.